She was one of the greatest racemares of recent times, and the chances of her having a similarly successful second career as a broodmare look highly promising if the beautiful foal she's pictured with here is anything to go by. 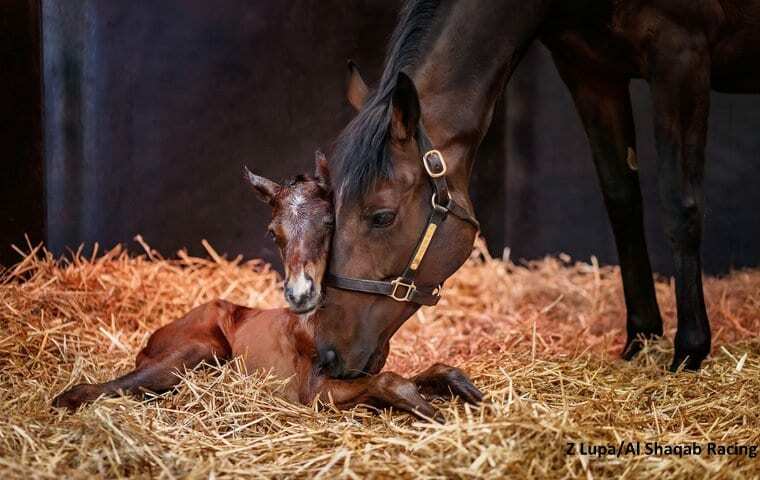 Dual Prix de l'Arc de Triomphe winner Treve gave birth to the filly by Shalaa at Al Shaqab's Haras de Bouquetot in Normandy in Northern France early on Sunday evening. All went well for the former Criquette Head-Maarek-trained superstar and her daughter, who weighed 55kg (121 pounds) at birth. It was a busy evening at the Normandy farm – the Treve filly was one of three Shalaa offspring to be foaled within a few hours of each other. Another G1-winning mare, Shotgun Gulch, who landed Keeneland's Vinery Madison Stakes in 2011, foaled a healthy filly minutes before Treve went into labour. A few hours later, Rjwa, third in the 2011 G1 Prix de Diane, foaled a strong colt by Shalaa. Al Shaqab reported that all mares and foals are happy and healthy and will soon have their first paddock turnout. The three new arrivals join an impressive batch of foals already on the ground at Haras de Bouquetot from the first crop of Shalaa. Al Shaqab says the dual 2-year-old G1 winner seems “to stamp his products a lot so far”. The son of Invincible Spirit is already the sire of a standout colt by G2 winner Al Wathna, as well as a stunning filly by Al Anqa, sister to 2012 Breeders' Cup Filly & Mare Turf winner Zagora, and a colt by G3-placed Gherdaiya. Shalaa shuttled to Arrowfield Stud in New South Wales for the Australian breeding season last year. Treve already has a yearling on the ground. Last year she gave birth to a colt by Dubawi at Haras de Bouquetot. This entry was posted in Bloodstock, NL Article and tagged al shaqab, arc de triomphe, Criquette Head-Maarek, Haras de Bouquetot, prix de l'arc de triomphe, shalaa, treve by Press Release. Bookmark the permalink.